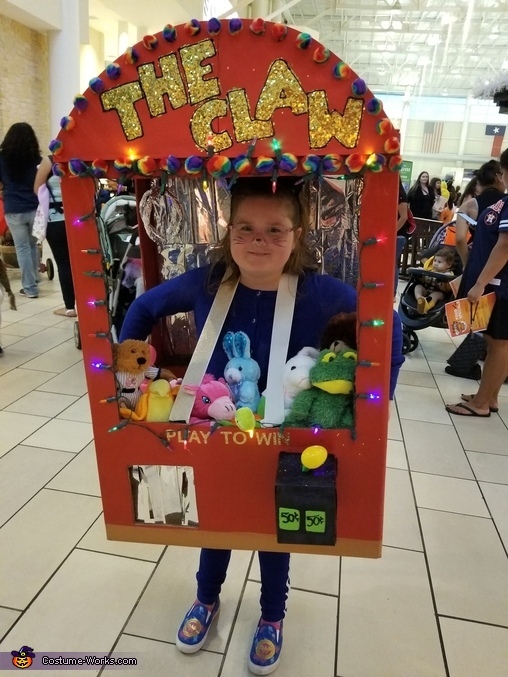 I created this costume for my daughter, who loves claw machines. I used a box and cut 3 large spaces in the front and sides. I painted it and added decor. I lined the outside with Christmas lights that are battery powered. I used lots of glitter and sparkle to make it shine. A tissue box is used for the coin deposit and joystick box. Elastic bands were used as shoulder straps. Two headbands covered in foil were used to make the claw. It took a while to get it together but she was the star at the trick or treating event we went to! This is so original! She looks awesome! I wish I was this creative with costumes, or this good with arts and crafts! This is the most amazing creative costume ever!! Adorable costume!!! I LOVE IT!!!! This is so creative!! Best costume!! Very original! Most kids dream to be inside one too! Great job super mom! Love it! Love this costume! So creative and clever. Good job mom! Such a creative costume idea! Homemade with love costumes are simply the BEST! Kudos to you guys on this creative costume! One of the coolest, most creative costumes I have seen this year! Just awesome! Loved seeing her in this! She really loves those machines and this is just one of the most creative costumes I've ever seen! Great job to you both! This costume is so creative and cool!!! This is the best costume I have ever seen! So well constructed! This is amazing! Such creativity! Such an original costume and super creative, great job!! !